"As afore-mentioned, meals were bountiful. We had a "hanging lamp" over our table and one (with prisms) in our parlor at the house next to the church. A characteristic touch of this picture is the Grandma. There was one in almost every home. It was expected and gave the home dignity. Or else there were one or more maiden aunts or dependent cousins. Very few men there were who did not generally very cheerfully and graciously assume the support of either mother or mother-in-law (after fifty) or a brother's orphan children or an unmarried sister, and these certainly paid their way, too, in work." The image depicts a family in the 1930s or 1940s, but it must have reminded Sarah of the atmosphere in her childhood home and in the homes of friends and neighbors. The real Thanksgiving-related treasure from her scrapbooks is this poem she wrote in 1895, when she was 12 years old. 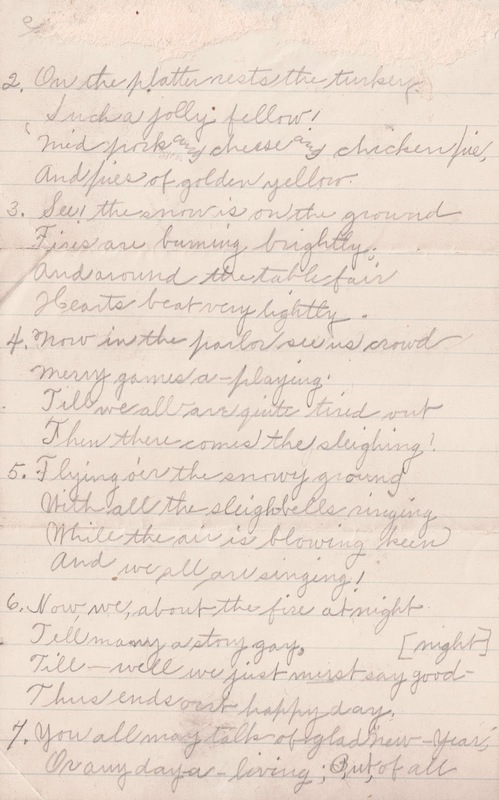 Images of the original writing, faded but still legible, follow the transcription. It makes me quite ecstatic! In the sty, a pig. Oh the table! What a sight! Is what each one wishes. And pies of golden yellow. See! The snow is on the ground. Then there comes the sleighing! And we all are singing. Thus ends our happy day. 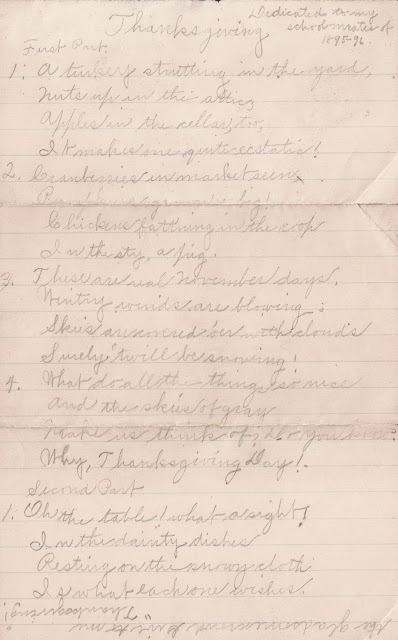 On this Thanksgiving Day, I am grateful to you and others who read my blog and share your thoughts about Sarah Eva Howe's scrapbooks and the history they hold. I join Sarah in wishing you and yours a meaningful Thanksgiving Day. The post dated Oct. 23, 2016, introduced Sarah Eva Howe's uncle William F. Howe and his family – including Louisiana "Aunt Lou" Winslow Howe and six children, Sarah's first cousins. Today we get better acquainted with one of those cousins – the only one of the six to move more than 100 miles away from the Howe homes and businesses in Carrollton, Kentucky. First, some background: The practice of law was a family tradition for the Howes and Winslows of Carrollton, Kentucky. 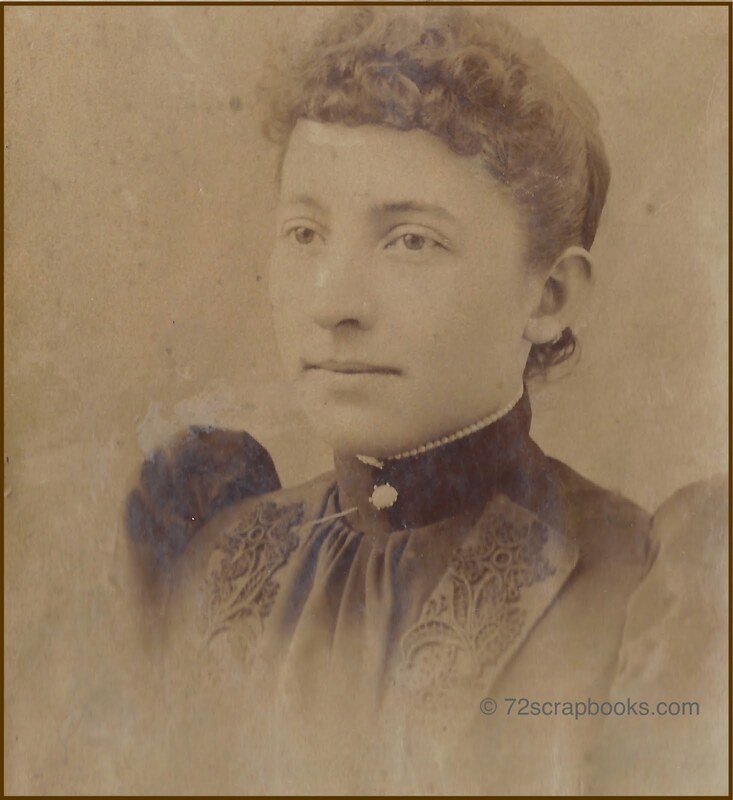 While the first Howes arrived in that town in 1859 and became successful entrepreneurs in textiles, tailoring, retail, and banking, the Winslows – who had been there since 1800 – tended to gravitate to careers in the law. After Lou Winslow married William Ficklin Howe in 1873, the "merger" shows up in the career choices of their own children and the children of their siblings. Some Howes went into law; some Winslows became bankers or businessmen. As a consequence, the Winslow law firm became the firm of Winslow & Howe in the early 1900s. One attorney who got his start at the family firm was Beverly Winslow Howe, grandson of the immigrant John Howe. His first and middle names are from his mother's side – his grandfather and an uncle, both named William Beverly Winslow. 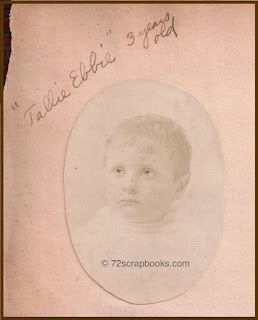 Beverly Winslow Howe was born 18 November 1885 in Carrollton, Kentucky, the fifth child of William F. and Lou Winslow Howe. Sarah mentions him in the early scrapbooks, and his name is included in some of her newspaper clippings and school event programs. Because Sarah was not only a cousin but best friend to Beverly's sister Jenne, Sarah saw Beverly often. Still, I found little in the scrapbooks to fill in a life story for him. For that I turned to the Internet. In Volume 22 of The Michigan Alumnus (accessed in Google Books) I learned that Beverly earned an undergraduate degree from the University of Tennessee in 1906 and lived in Nashville for a brief time to teach in a prep school for boys and work in the Vanderbilt University law school. Two years later he was admitted to the bar in Tennessee and in Kentucky and was practicing law with his uncle George B. Winslow and his brother John J. Howe in the firm of Winslow & Howe in Carrollton. 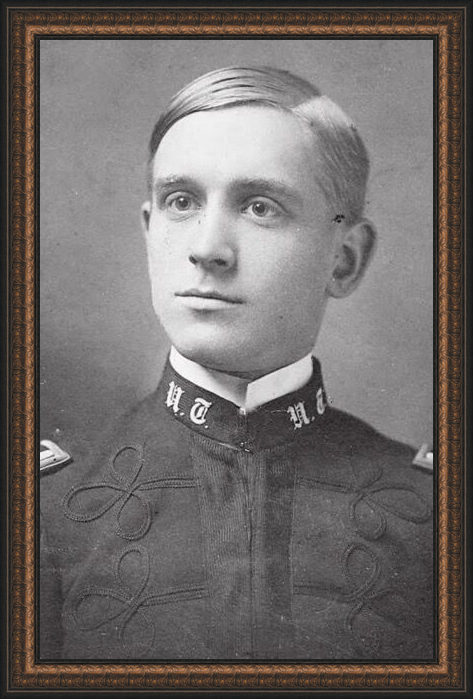 In 1910 he moved to Chicago to work as a law clerk for Chicago and Western Indiana Railroad Company and the Belt Railway Company. He is listed in the Class of 1910 in the University of Michigan's law school. Carroll County, a book by Phyllis Codling McLaughlin, refers on Page 56 to Beverly's service in World War I. According to Volume 47 of The Michigan Alumnus, Page 58, Beverly did "secret service work," but I don't know if that refers to his work during his military service. Beverly married Ruth Joyce Goessele of Chicago in 1916. They had two daughters: Louise Winslow Howe (1919-1988) and Isabelle Hall Howe (c1918-?). I'm intrigued by the bride's surname. Beverly's uncle Joseph Brown Howe married Sallie Goslee in 1889 in Carrollton. Based on frequent mentions in Sarah's scrapbooks, I think the Howe and Goslee families were close friends. Could the surname Goslee be an Americanization or variant spelling of the surname Goessele? Beverly may have traveled to England to do research for that Great Britain speech. He took his wife and daughters to England later. A passenger list shows they boarded the Queen Mary in Southampton on Aug. 30, 1939, and arrived in New York on Sept. 4 of that year. Unfortunately, Beverly died just two years later at 55 years of age. From his obituary, published in the Chicago Daily Tribune on May 2, 1941, we know that he continued the Howe family traditions of membership in a Methodist church and leadership roles in fraternal, professional, and civic organizations. Services for Beverly W. Howe, Chicago attorney for 30 years and author of several books on the life of Lincoln, will be held at 2:30 p.m. today in the Epworth Methodist church, 5253 Kenmore avenue. Mr. Howe died Wednesday in his home at 5953 Kenmore avenue. He was 55 years old. He was a past president of the Executives' club and of Kappa Sigma, national collegiate fraternity. 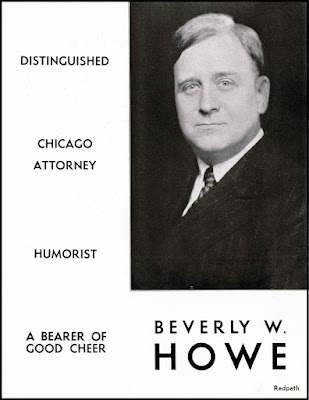 Mr. Howe was a member of the Chicago, Illinois and American Bar associations and the University club and was trustee of Lincoln Memorial University, Harrogate, Tenn. He leaves his widow, Ruth, and two daughters, Isabelle, and Mrs. Lloyd Norton Cutler. Mrs. Cutler was Beverly's daughter Louise Winslow Howe. His daughter Isabelle Hall Howe married John Lawrence Cummings just a few months after her father died. 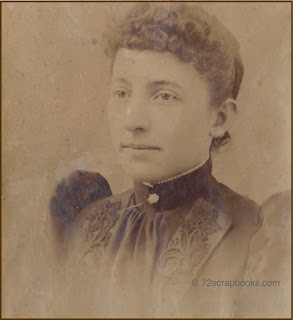 Services for Mrs. Ruth G. Howe, 86, of 1620 (1820?) Grove St., Evanston, will be at 11:30 a.m. Saturday in the chapel at 1567 Maple Av., Evanston. 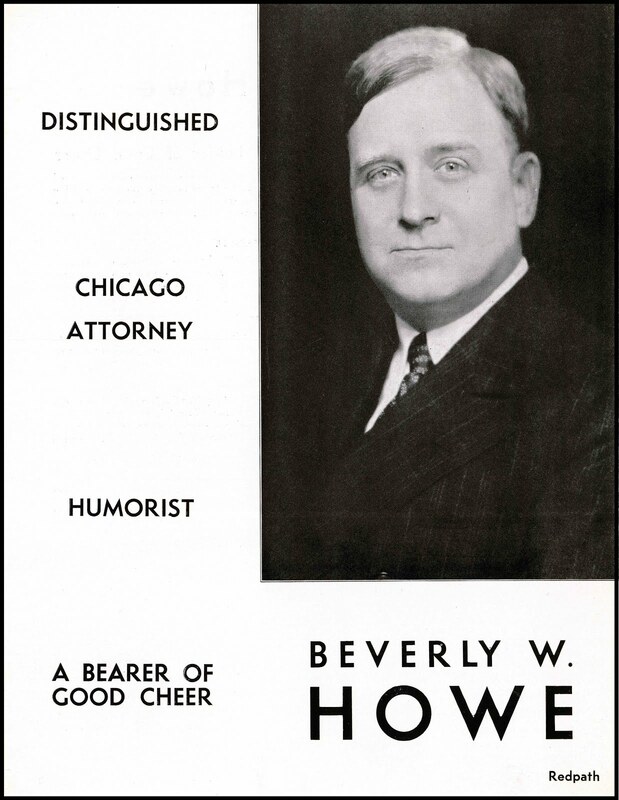 Mrs. Howe, widow of Beverly W. Howe, a Chicago attorney, died Wednesday in Evanston Hospital. She was a past national officer of Kappa Delta sorority. Survivors include two daughters, Mrs. Isabelle H Cummings and Mrs. Louise W. Cutler; a brother; seven grandchildren; and four great-grandchildren. On October 27, 2016, I posted a newspaper article about the history of Carrollton (Kentucky) High School. Later, on a loose page from Sarah's scrapbooks, I found this continuation of that article. While the first part of the newspaper article is mainly about the 1880s and '90s (which is when our scrapbooker Sarah Eva Howe attended school in Carrollton), this part moves into the early 1900s. Included are the names of teachers and administrators at all grade levels in the schools. I've transcribed the names for the sake of those doing online searches for their ancestors. Teachers listed were the same as in 1913-1914 except Mariam Tompkins replaced Emma Julia Kipping. Marion C. Beecher and Lillie Mae Powers are added to the list, and Mae C. Wetherill, Emma Julia Kipping, and Dorothy Adkinson are not included. Our scrapbooker Sarah Eva Howe saved many photos in her scrapbooks. Unfortunately, she didn't label all of them. Because of their placement in one of the earliest scrapbooks, I think these people are either members or friends of Sarah's Cost ancestors, who lived in Cincinnati. I can't know for sure, but maybe someone out there can identify them. Jones? Or Ames? He may or may not be a Methodist minister. 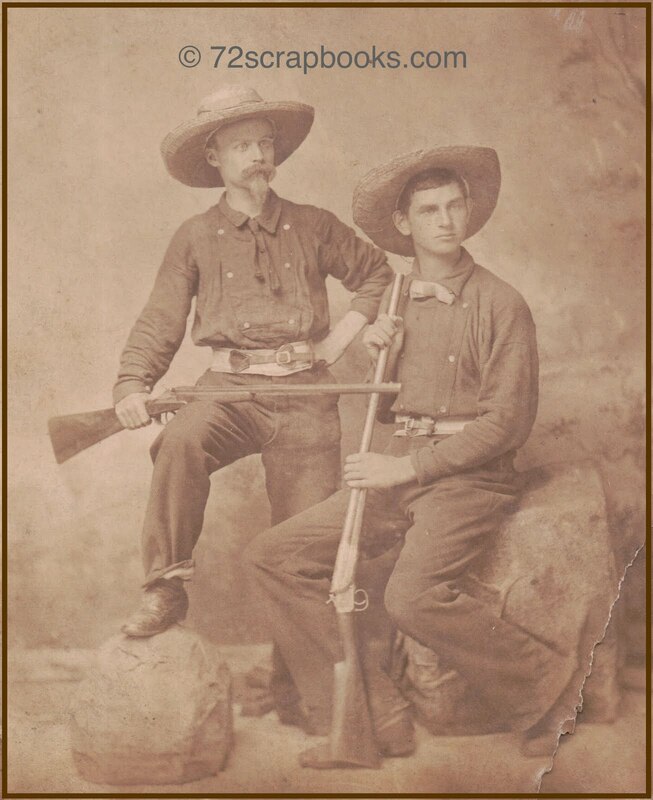 Two men posing in the same style as Sarah's father, Robert James Howe. The post dated August 11, 2016, speculates on the location and situation. 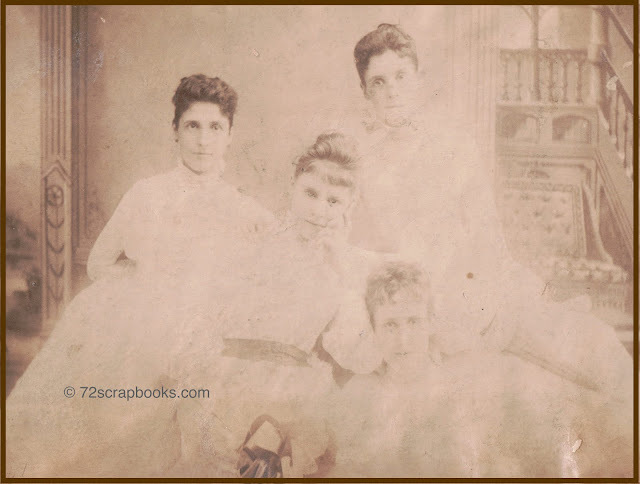 Four young women, all dressed in white. Debutantes ready for their cotillion? Sisters? Cousins? Last but not least, another image of women. This time we have names. Isabel Somerset is on the left. 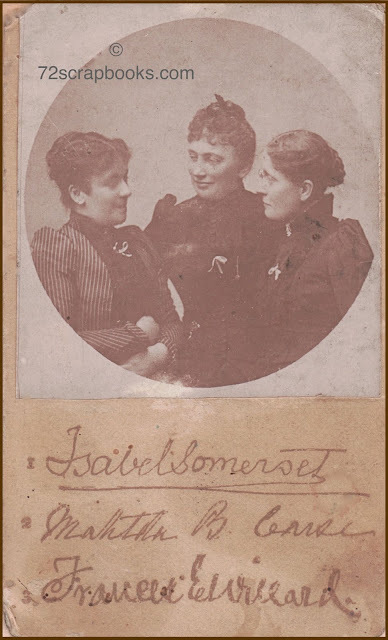 Frances E. Willard is on the right. Both were strong national leaders in the temperance movement during the 1880s and '90s. The Howes were strong leaders of the movement at the local and state levels and attended conventions supporting the movement. They may have met these women there, or maybe the photo was distributed or purchased at a convention. The name of the woman in the center is not so easy to decipher. Martha Bensley Bruere was a temperance leader, but I can't match that last name with the handwriting. 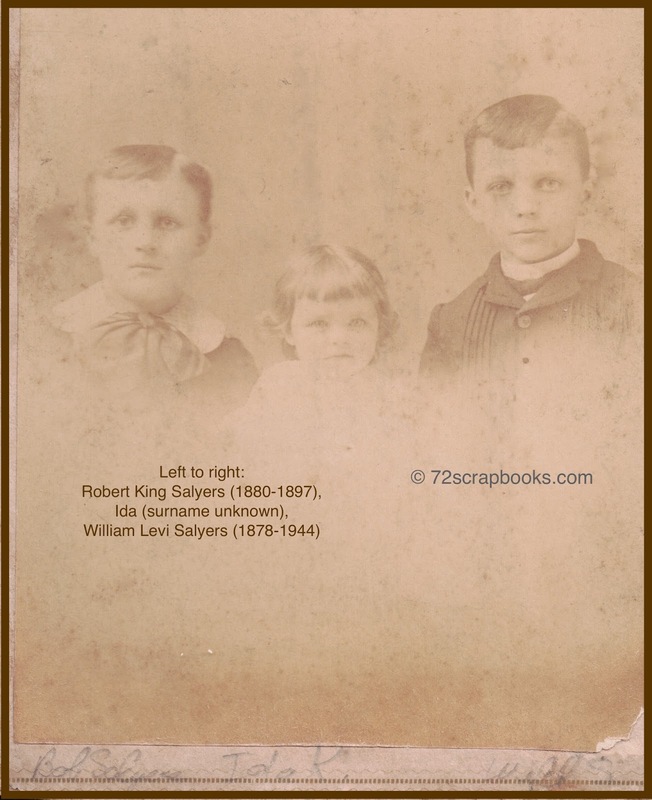 names at the bottom of this charming image, we know the boy on the left is Bob Salyers (1880-1897). On the right is Bob's big brother Will Salyers (1878-1944), who would grow up to be Sarah's husband. Both were sons of Charles David Salyers and Katherine King Salyers of Carrollton, Carroll County, Kentucky. Other family photos confirm this. I believe the little girl is Ida Ruth Salyers, a first cousin to the boys, daughter of their uncle William Levi Salyers (1860-1922) and Susie Giltner Salyers. The next image came to me from Bill Davis of Carrollton. He reports that his brother lives in this house on Highland Avenue, next to the funeral home. 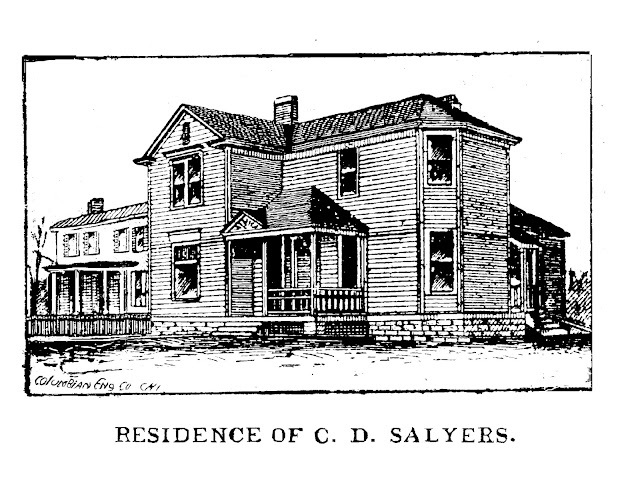 The house was once home to Charles D. Salyers. What a treat to have this image. Readers of the Carrollton Democrat back in late 1920s were so taken with Lou Winslow Howe's article about the history of Carrollton (Kentucky) Methodist Church that they prevailed on her to write another. This second article, recalling the living arrangements of the church's pastors, was even longer than the first! Here is my transcription of the clipping Sarah Eva Howe pasted into a scrapbook. Again we see many Carrollton names and details about their homes and affiliations. Like so many other clippings in the scrapbooks, this one was not dated. Lou Winslow Howe's reference to G.D. Prentiss as the current pastor puts the date of the article circa 1926. The former article, which was published in a recent issue, under the above caption, has elicited from friendly critics so many expressions of appreciation and commendation that I have been persuaded to cull from memory’s storehouse some well-authenticated facts in regard to the dwelling places of the preachers who, in early times, were dependent on the hospitality of those of the membership who chose to invite them into their homes. Such were the conditions in our Carrollton church for many years, until in 1850, the second year of the pastorate of Rev. 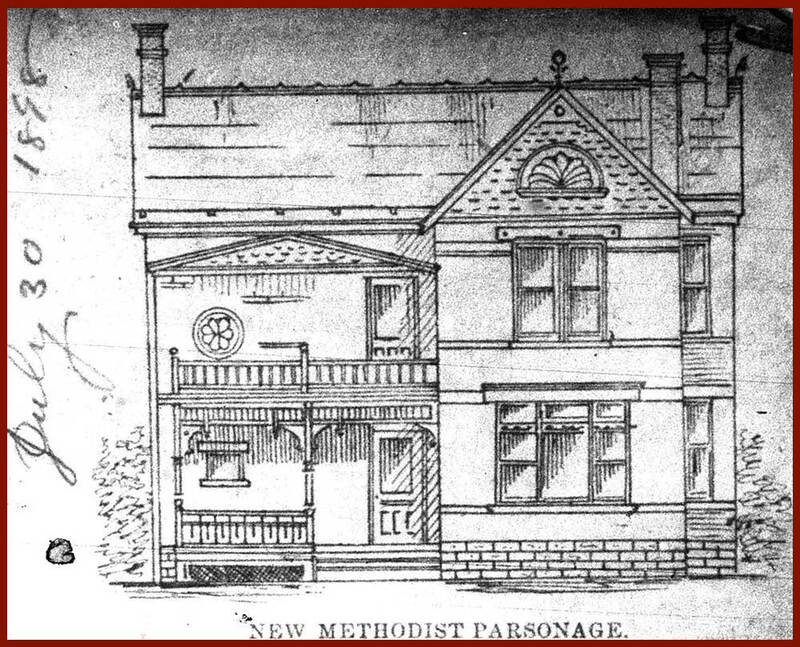 John B. Ewan, the contract was let to James F. Wyatt, a skilled carpenter, who belonged to one of the pioneer families of Methodism, to build a frame parsonage, facing east, on Seventh street, a short distance north of Seminary. This building, with some modifications, is now the comfortable home of the Kirby family. When first erected, this residence consisted of a front entrance hall, five rooms, and a long back porch on the west side. At the south end of it was a good-sized kitchen and a pantry adjoining. A coal house and wood shed were added and a small chicken coop, to whose contents the farming members were encouraged to contribute. In the rear was a fertile garden spot from which Brother Ewan supplied his family with almost everything they needed to eat. He was delighted with his surroundings and with great gratification the following September relinquished the parsonage, feeling that he was passing on a great favor to his successor, Rev. James Lawrence. This brother had come from the interior of the state and had cherished bright anticipations of living near the confluence of the rivers, where, in addition to hearing the boats whistle at night, he could have the pleasure of seeing them pass in the day time, so he left the parsonage vacant in the hands of the trustees and rented for his own use a house which stood down near the point, on the east side of First street, overlooking the wharf. During the delightful autumn weather he luxuriated in the glorious scenery and the invigorating atmosphere, but when the snows had fallen in December and the Frost King in January had congealed the waters into cakes of floating ice, and later the March winds began to howl, followed by the drenching rains of the Spring equinox, which filled both rivers to overflowing, he found his chosen place of abode, on a high mound, entirely surrounded by water, and realized that he had more than he had bargained for. He then decided that it would have been better if he had satisfied himself with the home that had been provided for him. The next pastor, Reverend Samuel Adams, and twenty-one of his successors were grateful to shelter their families under its protecting roof, though it frequently needed and received repairs, and quite a number hinted that it was a long distance from the church. Shortly after the arrival of Dr. Hiner’s family some of the good sisters of the church who were at the parsonage to assist them in “getting fixed up” discovered that his wife was not feeling well, and insisted on calling in medical attention. According to the diagnosis of the physician, Dr. L.E. Goslee, incipient typhoid fever had been sapping her vitality for at least ten days. In less than a month her spirit was called “up higher” and her mortal remains were interred in the church yard. Dr. Hiner was then nearing the completion of his threescore and ten. He was not vigorous as in former years, and he became impressed with a decided preference to live nearer the church, so the official board gratified him by renting out the parsonage, and securing for his accommodation, from the heirs of the late Rev. Wm. McD. Abbett, the house in which he had spent his last days and from which his freed spirit had taken its departure. This house, a two-story brick on High street, between Fourth and Fifth, is now owned by Mr. Geo. S. Lee and occupied by himself and family. Dr. Hiner, whose sermons were uniformly logical, forceful and eloquent, entered upon the fourth year of his pastorate with enthusiasm of spirit but with waning physical vitality, and in March 1896, he suffered an attack of paralysis from which he never fully recovered, although at the Conference in September of that year the Bishop appointed him to serve the Warsaw circuit, which was the last place he attempted to fill.
. . . As the summer passed he hoped to recruit sufficiently to attend the Annual Conference, but a kind Heavenly Father decreed otherwise, and just at sun-rise one morning near the middle of September his spirit took its flight to the abode of the blessed, and his body was placed by the side of his wife, in the church yard, which resting place eleven years before had been chosen by himself. Dr. Hiner’s successor in Carrollton was Rev. Wm. 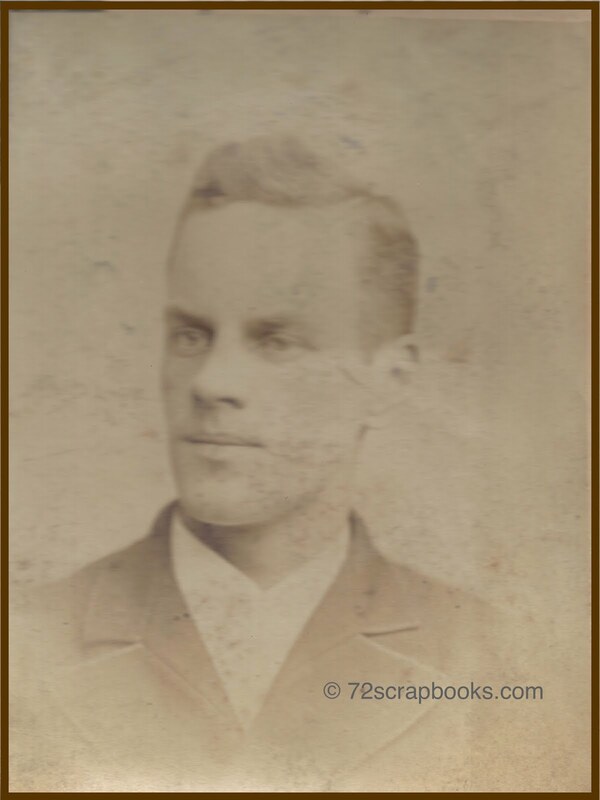 Shoesmith, who moved into the Seventh street parsonage October 1, 1896. Having an agricultural taste and two boys in their teens, he encouraged himself in an eager desire for more land to cultivate, so early in the following spring on his own initiative he vacated the parsonage and rented the farm just beyond the city limits, afterwards purchased and now occupied by Mr. J.W. Harrison. at 219 Fifth street was completed, and Rev. J.D. Redd was the first preacher to occupy it. 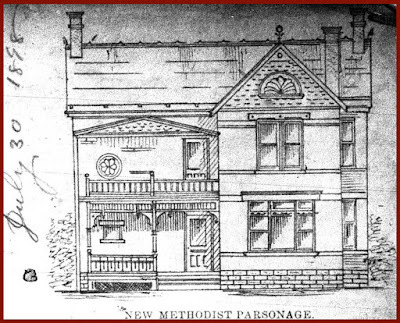 The same has been a much appreciated home for our pastors during the first quarter of the twentieth century. The present occupant, Rev. G.D. Prentiss and wife, keep it in excellent condition and spare no pains to beautify the premises with shrubs and flowers. Rev. W.T. Rowland, our highly esteemed “pastor emeritus” (local superannuate), for the past thirty years has resided in the Conn homestead, from which, in 1875, he claimed as his bride Miss Mary Ethylene Conn, to assist him in his work as pastor at Danville, Ky.
Other brides who have gone from our midst to itinerate as helpmates to pastors of the Kentucky Conference were Miss Margaret S. Winslow, who was united in marriage with Rev. William McD. Abbett in 1826; Miss Sallie Turpin, who married Rev. 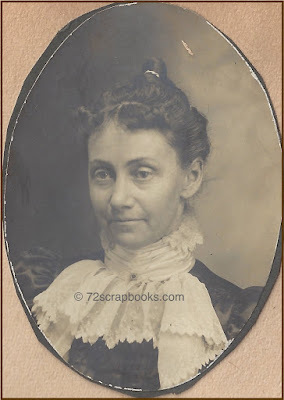 E.L. Southgate in 1867; Miss Anna Browinski, who married Rev. J.E. Wright in 1889, and Miss Mary E. Coliver, who married Rev. George Froh in the old church June 27, 1870. The two last named, now on the retired list, are still living together in their own home in Lagrange, and celebrated their golden wedding anniversary six years ago. Though physically frail, they are spiritually alert, relying on the promise of God . . .
. . . Some time ago it became quite manifest that our auditorium needed to be re-decorated; we also became aware of the fact that our present organist, Mrs. R.M. 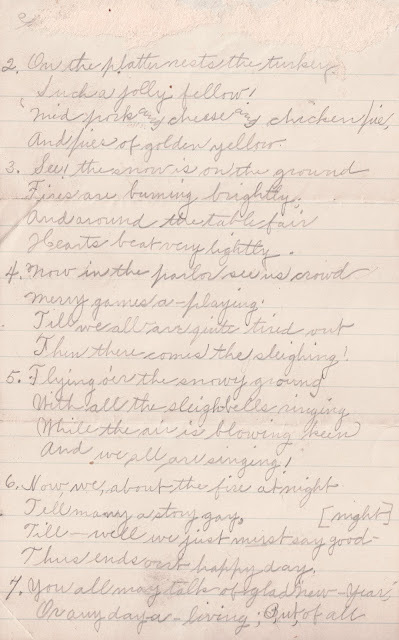 Barker, an accomplished musician, could learn to handle, with pleasure and satisfaction to herself and the entire congregation, a much larger instrument than the small pipe organ to which we had been listening for the past forty years. Also we needed more rooms, more conveniently arranged for our now well-graded Sunday school. Our small hot air furnaces, which sometimes failed to furnish adequate heat, were also worn out. After several preliminary meetings during the spring months, our pastor, Rev. G.D. Prentiss, who is now serving the fourth year of his quadrennium, called a special session of the church conference and appointed committees to decide what improvements were practicable and how the funds should be raised to defray the inevitable expenses. Lou Howe then generalizes about the church hiring an architect; remodeling the church; adding several rooms; and installing a new organ, three pianos, a Raymond Vapor Heating System, Battleship Linoleum in the halls and stairways, and a Wilton velvet carpet in “the hallowed places.” She identified as project leaders George B. Winslow and his brother William Beverly Winslow, an attorney living in New York, who in 1892 had managed the replacement of clear glass with stained-glass windows.